Davian Williams has helped Cavaliers win their first two games. 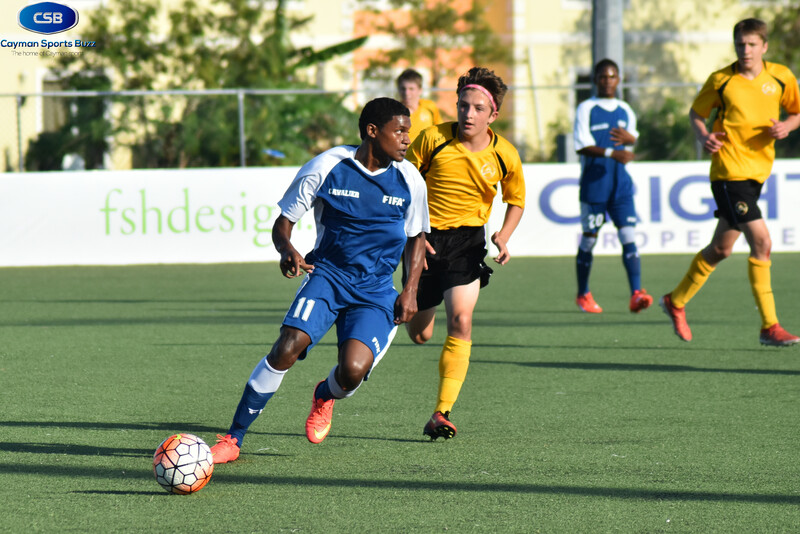 The race for spots in the semi-finals of the 2017 Cayman Airways Invitational U15 Youth Football Cup is taking shape after two days of group play. 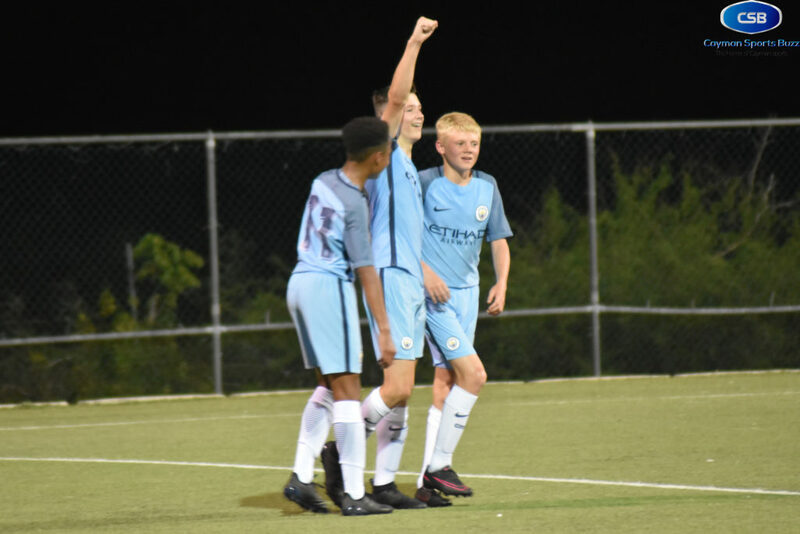 Cavaliers Soccer Club from Jamaica has taken the lead in Group A with two wins in as many games to start the competition, while in a highly-competitive Group B, defending champions Manchester City are ahead. Meantime, La Ceiba F.C. 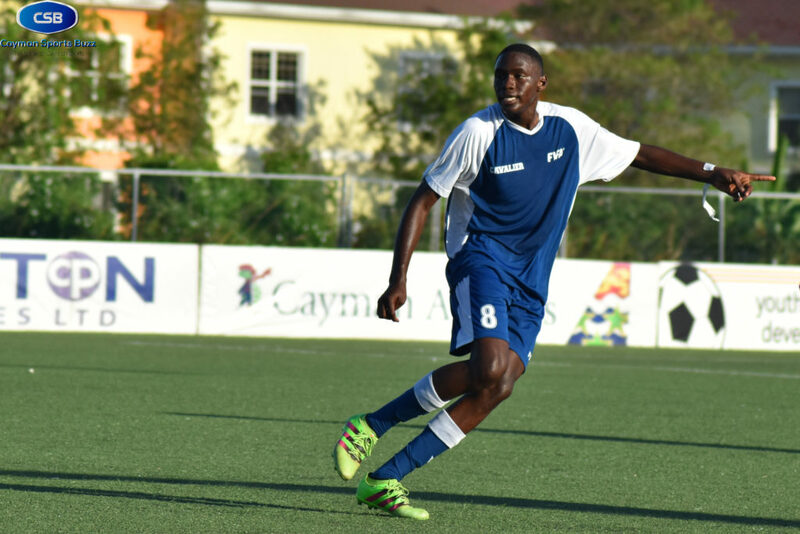 of Honduras and Cuba Federation are in a race for the top spot in Group C.
Cavaliers’ Alex Johnson has scored three goals so far. Cavaliers dominated possession early but appeared comfortable with shooting from distance, as at least a half-dozen shots within the first 15 minutes sailed well high of the goal. After being unsuccessful from shots beyond 20 yards, the Jamaicans adjusted and in the 30th minute, Isaac Scott found Alex Johnson inside five yards, as he knocked the ball past the keeper comfortably for his third goal of the tournament. After a 1-0 lead at the half, it took two minutes into the second session for Cavaliers to double the advantage with Tyrese Durrant scoring. Although Cavaliers controlled the ball for much of the game, a spirited Alchemy side kept pressing as they were spurred on by vocal supporters who travelled from Minnesota with the team. However, it was Cavaliers who found ways to score, including substitutes Rojay Nelson in the 60th minute and Kamani Maxwell in the final minute of injury time. 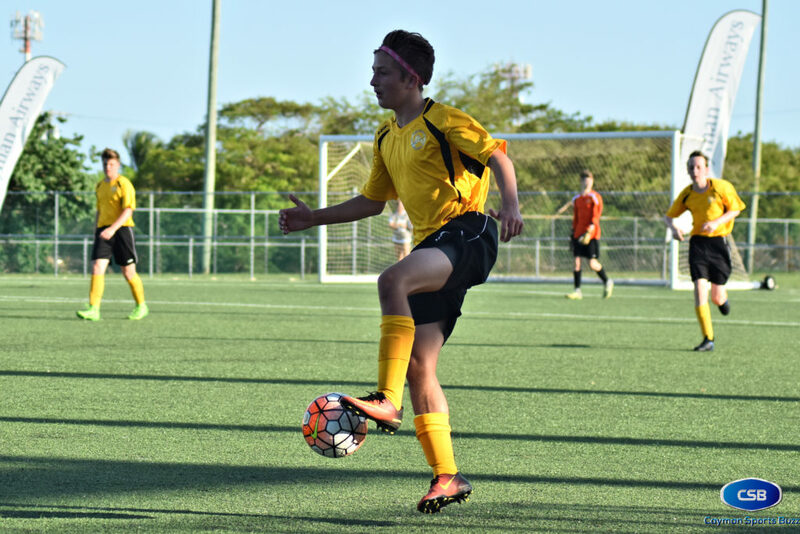 Alchemy returns to Ed Bush Sports Complex Thursday night for a matchup with the Cayman Islands National U15 Team, while Cavaliers, who top the group so far with six points from back-to-back wins, gets a rest day before meeting the hosts Friday night. 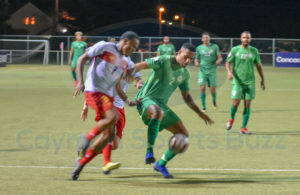 With a few hundred people packed into the Ed Bush Sports Complex for the Cayman Islands opening game, both teams started off aggressively, moving the ball with pace. 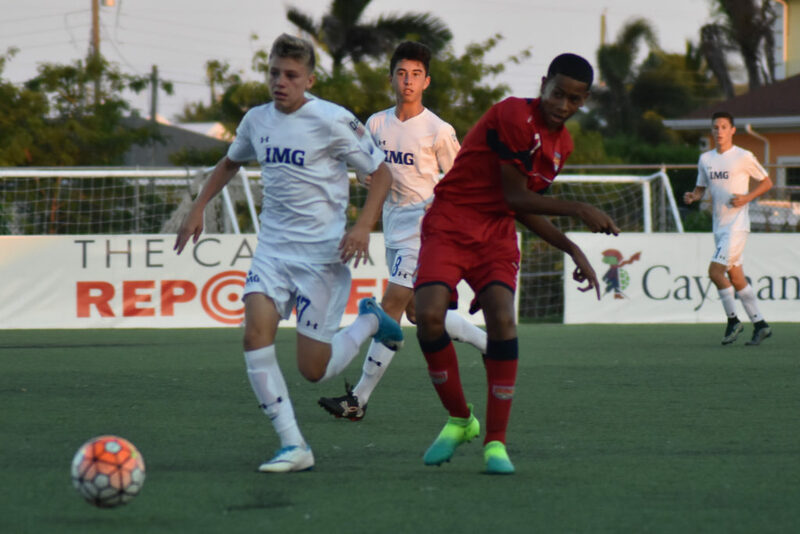 IMG got the breakthrough in the 12th minute with a screamer from Charlie Strine flying past Cayman netminder Finn Milward. Ty Sanchez doubled the lead nine minutes later. Team Cayman tried to create chances, as forward Gunnar Studenhofft constantly showing his intent. 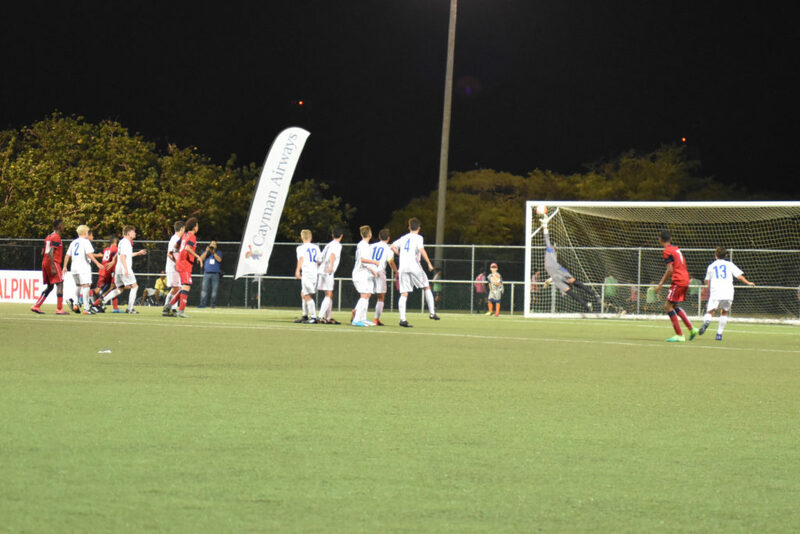 In the 26th minute, the crowd came to life when David Pitcain took the ball from inside the Cayman half and pushed toward the IMG goal in tandem with Studenhofft but the run was stopped by an IMG defender inside the 18-yard box. IMG led 2-0 at the half. 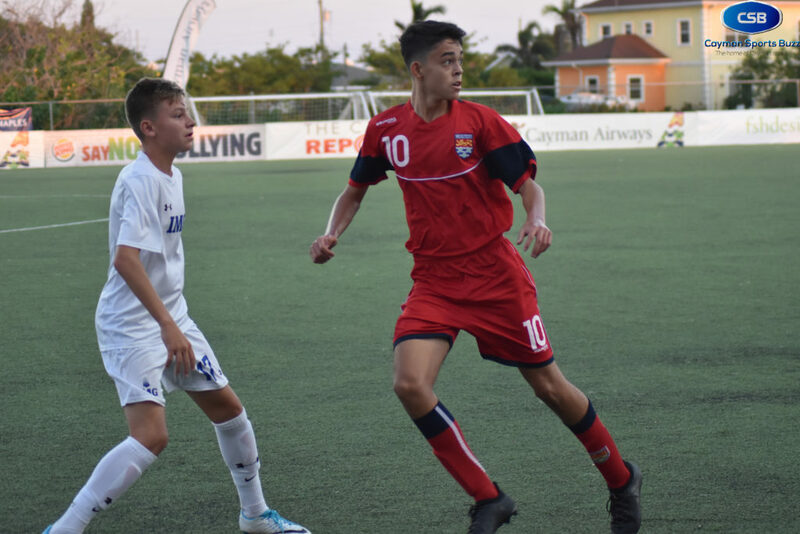 David Pitcairn (10) was one of the bright spots for Cayman. Five minutes after the re-start, Riley Meagher tripled the lead. 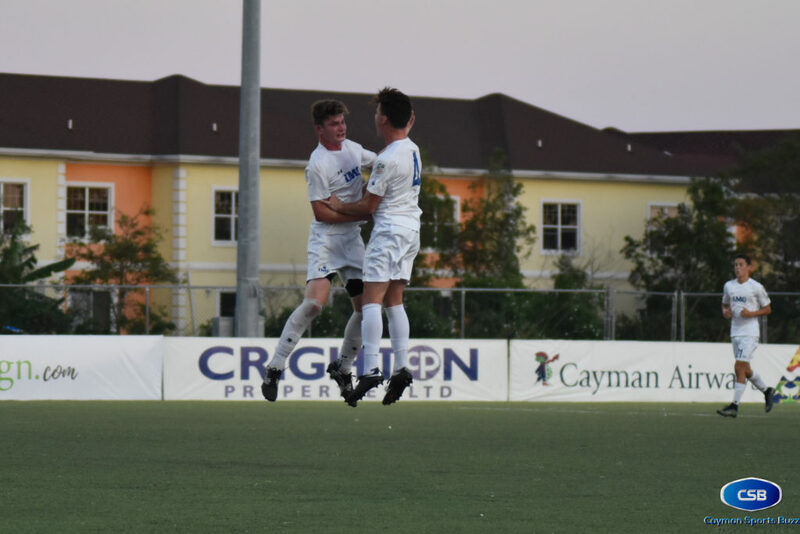 Cayman continued to press but IMG keepers, Sam Lee and Brooks Thompson came up with multiple saves, including Thompson in the 66th minute to deny a Cayman penalty kick and multiple rebound efforts. Cole Tetler, who came on from the bench, added a fourth for IMG in the 69th minute, as IMG won 4-0. 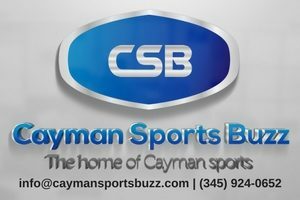 Cayman plays Achemy DSC Thursday at 8:00 p.m. at Ed Bush Sports Complex, while IMG Academy has a rest day. Diego Gonzalez scored twice for Houston. Manchester City’s Charlie McNeil celebrates his goal. 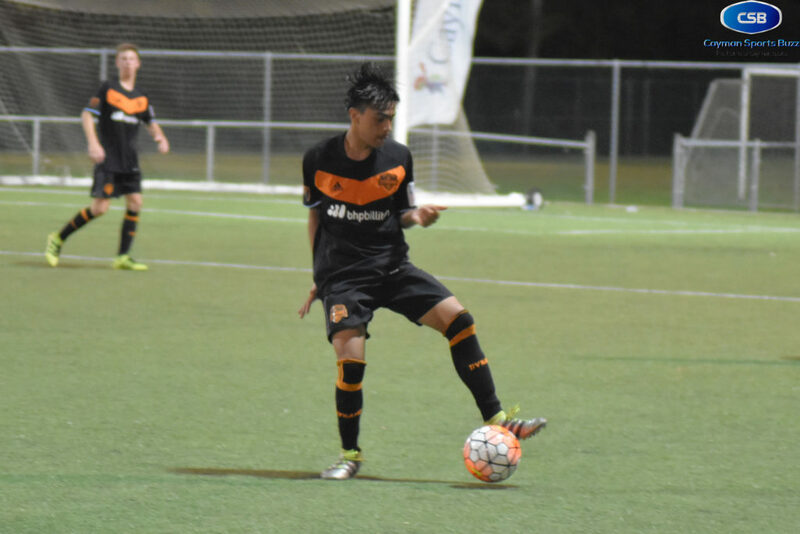 The final game of the evening at Ed Bush saw a competitive affair between Manchester City and Houston Dynamo, both coming in off draws in their opening matches. 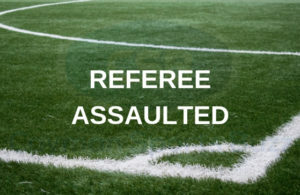 Houston dug themselves into a hole after defender Caleb Allen’s attempt to clear the ball with a header saw it going into the back of his team’s net in the 12th minute. It was not until the half-hour mark that Manchester City scored on their own accord – Charlie McNeil putting the 20016 champions ahead by two goals with his second of the tournament. Houston pulled one back in the 32nd minute thanks to Diego Gonzalez. With the score 2-1 in favour of Manchester City at the half, the second frame shaped up for an exciting finish. Gonzalez got his second tally for Houston to level the score 2-2 in the 47th minute. Both sides continued to work the ball methodically across the pitch in search of a winner. It was Manchester City who got what they were looking for when James McAtee knocked one home in the 60th minute. Both teams are back on the field Thursday, with Houston playing Trinidad & Tobago and Manchester City faces D.C. United.